For business or leisure, with the family or on your own, the Superior room offers all the comforts and amenities you expect from Novotel. 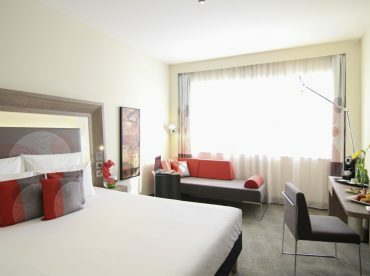 Our 26 m2 (280 sq ft) guestroom is smart and tranquil. Enjoy large beds, complimentary Wi-Fi and a contemporary bathroom stocked with fair-trade products. For your entertainment, the flat-screen TV has over 70 international channels. Choose the bed configuration that best suits your needs: two twin beds or one queen size bed for up to two adults. Six of our rooms are designed specially for guests with limited mobility. At Novotel, it’s easy to relax, indulge and feel at home.